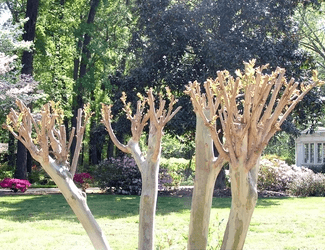 It’s important to prune your Crape Myrtle trees annually, especially here in the South. We are running a special from December 21 through February 28 on Crape Myrtle Pruning. Submit the form below for our Crape Myrtle Web Special and you will receive a 10% discount on our pruning service. Sharing this information with us will help us give you a quick estimate. If the trees are different heights, please tell us approximately how tall the tallest tree is.